Global Engineering and Materials, Inc. (GEM) has developed a hybrid structure evaluation and fatigue damage assessment toolkit for Abaqus (HYSEFDA) to perform residual strength and fatigue life prediction of an arbitrary structure with the coexistence of metal ply cracks and interface delamination cracks. The toolkit can characterize multiple initial delaminations and ply cracks that are independent of an existing finite element mesh and track their moving fronts without remeshing. A solid shell based on an assumed-strain approach is implemented to capture 3D stress distribution in thin plies. The phantom pair element approach and the VCCT are applied to extract the stress intensity factor at crack tips. A virtual extension technique is used to improve the SIF prediction. A user-defined element for a discrete spring have been developed and coupled with a virtual crack closure technique (VCCT). 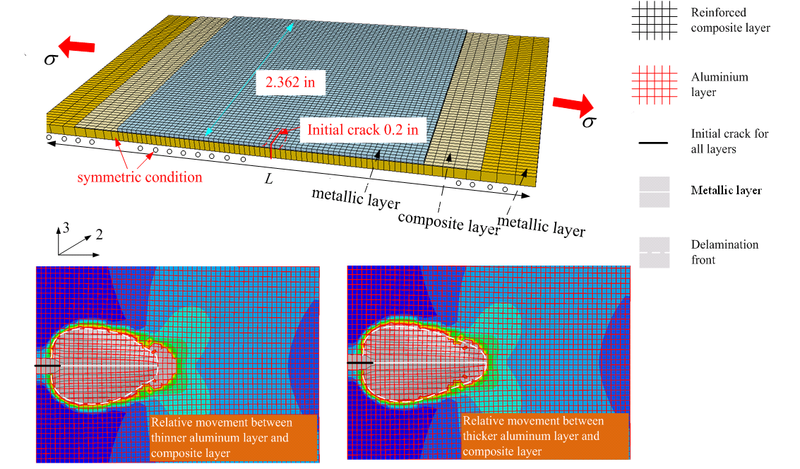 A two-way fatigue damage control module has been developed based on the criticality of the fracture parameters at either the delamination or the metal crack front. The tool can be used: 1) to accelerate fatigue damage and residual strength assessment, assist in decision making for effective maintenance and repairs, and design reliable advanced hybrid structures to ensure airworthiness; 2) to specify fatigue performance limits and safety standards for structural certification and design agencies; and 3) to provide optimal designs through the effective use of new analysis tools, risk evaluation methods, and health management procedures for aircraft manufacturers. The HYSEFDA has been applied to evaluate the performance of a non-conventional fiber metal laminate (FML) with embedded metal plies of different thicknesses. As shown below, the FML is symmetric with respect to the middle plane. The middle metallic layer has a thickness of six times higher than its skin layer. An initial through the thickness crack is introduced for damage tolerance assessment. The two pairs of metallic-delamination cracks exhibit different growth rates. Both the metallic crack and the delamination crack associated with the thicker (middle) metallic layer grow faster than their counterparts associated with the thinner metallic layers. In addition, as shown in the figure below, the complicated delamination shape can be accurately captured based on the present mesh independent spring model. In addition, the HYSEFDA toolkit has been applied to evaluate the extended fatigue life from composite patch repair of cracked aluminum components. Through a close collaboration with engineers at Naval Surface Warfare Center at Carderock Division (NSWCCD), GEM is validating the HYSEFDA toolkit using the fatigue test data generated by NSWCCD (Hart et al. (2014), Fatigue performance and analysis of composite patch repaired cracked aluminum plates, 2014 Ship Structure Committee Symposium, Linthicum Heights, MD). As shown below, life prediction and its associated damage evolution has been performed for the NSWCCD’s testing article with a composite patch repair on a crack aluminum plate. 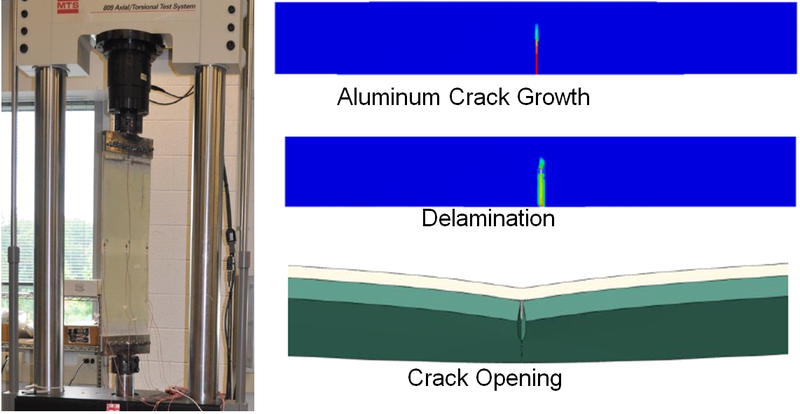 The fatigue crack growth for the repaired aluminum plate is shown below with a delamination zone accompanied with a moving crack front. 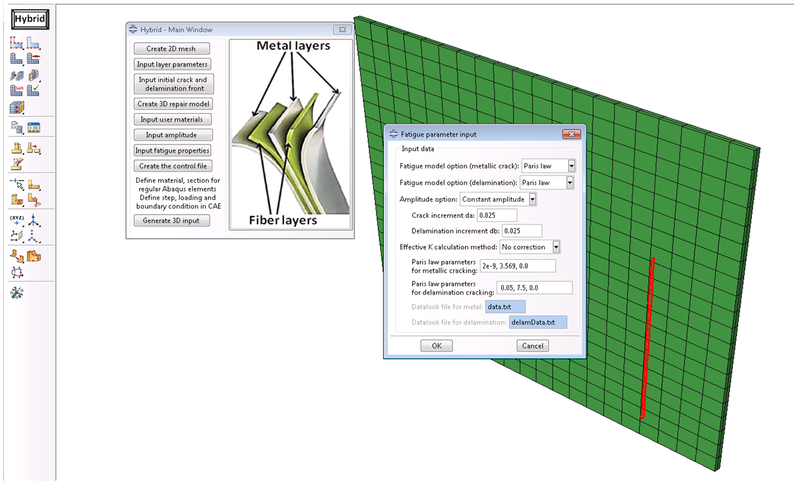 To facilitate the model generation, preparation of HYSEFDA input files, and results display within the Abaqus toolkit, a GUI is developed within Abaqus/CAE as shown below. The GUI provides an efficient way in development of various repair models with different patch sizes, shapes, ply layups, and initial defect configurations.